This article is about the film. For the novel, see The Voyage of the Dawn Treader. For the video game, see The Chronicles of Narnia: The Voyage of the Dawn Treader (video game). For the soundtrack, see The Chronicles of Narnia: The Voyage of the Dawn Treader (soundtrack). For the TV serial, see Prince Caspian/The Voyage of the Dawn Treader (1989 TV serial). 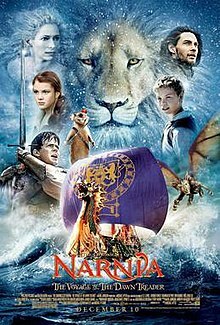 The Chronicles of Narnia: The Voyage of the Dawn Treader is a 2010 American fantasy adventure film based on The Voyage of the Dawn Treader, the third novel in C. S. Lewis's epic fantasy series The Chronicles of Narnia (and fifth in internal chronological order). It is the third installment in The Chronicles of Narnia film series, and the final film in the series to be produced by Walden Media. This is the only film in the series to be distributed by 20th Century Fox, as Walt Disney Studios Motion Pictures chose not to distribute the film after Disney went into a budget dispute with Walden Media. However, Disney later acquired the rights to the film as part of its acquisition of 20th Century Fox on March 20, 2019. The film is set three Narnian years after the events of Prince Caspian. The two youngest Pevensie siblings, Edmund (Skandar Keynes) and Lucy (Georgie Henley), are transported back to Narnia along with their cousin Eustace Scrubb (Will Poulter). They join the new king of Narnia, Caspian (Ben Barnes), in his quest to rescue seven lost lords and to save Narnia from a corrupting evil that resides on a dark island. Each character is tested as they journey to the home of the great lion Aslan (Liam Neeson) at the far end of the world. Development on The Voyage of the Dawn Treader began in 2007, while Prince Caspian was still in production. Filming was supposed to take place in Malta, the Czech Republic, and Iceland in 2008 with Michael Apted as the director, for a planned release in 2009, but production was halted after a budgetary dispute between Walden Media and Walt Disney Pictures concerning Prince Caspian's performance at the box office, resulting in Disney departing the production and being replaced by 20th Century Fox. Filming later took place in Australia and New Zealand in 2009 and was converted into 3D in 2010. It was released in traditional 2D, RealD 3D, and Digital 3D, and a limited release in 4D. Edmund and Lucy Pevensie are staying with their irritating bookworm cousin, Eustace Scrubb, until the war is over, separated from Peter and Susan. Edmund is still too young to enlist in His Majesty's Armed Forces. At their cousin's home, a painting of a ship on the ocean transports Lucy, Edmund and Eustace into an ocean in Narnia. They are rescued by Caspian, who captains the Dawn Treader. He invites them on a voyage to rescue the seven Lords of Narnia whom his uncle Miraz banished. In the Lone Islands, where slavery is common, Caspian and Edmund are captured and imprisoned, while Lucy and Eustace are sold as slaves. Caspian meets one of the lost lords (Lord Bern). They are rescued at the slave market by their crew, who battle the slave traders and turn the corrupt governor Gumpas out of office. Bern then becomes the new governor. At another island, Lucy is abducted by the invisible Dufflepuds, who force her to enter the manor of the magician Coriakin to find a visibility spell. She does so, and later introduces him to her friends. Coriakin encourages the crew to defeat a mysterious green Mist by laying the lords' seven swords at Aslan's Table on Ramandu's island, but warns them they are about to be tested, through temptation. Another sword is recovered from a magical pool that turns anything that touches it into gold, including one of the lost lords (which leads to a significant fight between Edmund and Caspian). Meanwhile, Eustace finds, and steals from a rock pit full of treasure. While Edmund and Caspian look for Eustace, they discover the remains of another lost lord. A dragon approaches and is driven away from the Dawn Treader. The dragon is revealed to be Eustace, transformed by the treasure after succumbing to its temptations. Reepicheep befriends Eustace, and Eustace is touched by the mouse's kindness. He undergoes a change of heart and becomes helpful to the crew. The crew arrive at Aslan's Table to find three lost lords sleeping. As they place their six swords on the table they realize one is still missing. A star descends from the sky and transforms into Lilliandil, a beautiful woman who guides them to the Dark Island, lair of the Mist, where they discover the last surviving Lord, Rhoop. Edmund's fear manifests itself as a monstrous sea serpent that attacks the ship. Eustace fights the serpent, but Rhoop wounds him with the last sword, causing him to fly away with the sword impaled in his side. He encounters Aslan, who transforms him back into a boy, removes the sword from his body and sends him to Ramandu's island with it. As the crew fights the serpent, the Mist appears before Edmund as Jadis, the White Witch. Eustace reaches the table and fights through the Mist to place the sword upon it, allowing the swords to unleash their magic and bestow Peter's sword (of which Edmund was in possession) with the power to slay the serpent, the death of which awakens the three sleeping lords, destroys the Mist and Dark Island and liberates the sacrificed slaves. Eustace rejoins Lucy, Edmund, Caspian, and Reepicheep, and they sail to a mysterious shore before a massive wave. Aslan appears and tells them that his country lies beyond, although if they go there they may never return. Caspian refuses, knowing that he has more duties to do as king, but Reepicheep is determined to enter, and Aslan blesses him before he paddles beyond the wave. Aslan opens a portal to send Lucy, Edmund and Eustace home, but informs Lucy and Edmund they have grown up and can never return to Narnia. Aslan encourages them to know him in their world by another name, and tells a reformed Eustace that he may return. The three enter the portal and swim up to the bedroom. Eustace hears his mother announcing a visitor, Jill Pole. The three leave the room, stopping to look back at the painting, which shows the Dawn Treader sailing out of sight. Skandar Keynes as Edmund Pevensie: Edmund is the second-youngest of the Pevensie children and a King of Narnia. He is more matured after the events of Prince Caspian, and he takes good care of his younger sister and cousin while they embark on a voyage to defeat the enemy. On his last journey, his hunger for more power against Caspian and the White Witch is being tested. Georgie Henley as Lucy Pevensie: Lucy is the youngest of the Pevensie children. A Queen of Narnia who first discovered the world of Narnia during the events of The Lion, the Witch and the Wardrobe, she comes back to Narnia to save it from a threatening evil while her faith is being tested along the way. Henley feels that Lucy's desire to be more beautiful than her sister Susan represents the dilemma of modern teenage girls on beauty and image. Will Poulter as Eustace Scrubb: Eustace is the Pevensie children's annoying cousin who gets transported to Narnia for the first time. At first, he irritates everyone with his bad attitude, but he dramatically changes after he is cursed and becomes a dragon. With the support of his cousins and the warrior mouse Reepicheep, Eustace becomes a more generous and cooperative soul. He uses his dragon form to good advantage first when the Dawn Treader is caught in magically induced doldrums by towing the ship and later attacking the sea serpent, earning the crew's respect. Ben Barnes as King Caspian: Caspian was raised as a Telmarine prince and was helped by the Pevensie children to ascend to the throne as the new King of Narnia during the events of Prince Caspian. As the King of Narnia, he has grown into a wise young man and embarks on a voyage to seek the seven lost lords of Narnia and to defeat an enemy who threatens to corrupt it. Along the way, his faith is tested when he is tempted by the green mist of Dark Island, which appears to him as his greatest fear—his father feeling nothing but disappointment in him. Also on the voyage, Caspian finds a new love interest when he meets Lilliandil on Ramandu's Island and is instantly smitten with her. Simon Pegg as Reepicheep (voice): Reepicheep is the valiant swashbuckling mouse who aided Caspian and the Pevensie children during the events of Prince Caspian. He joins Caspian in the voyage on the Dawn Treader because he is aware that his time is at an end; he must seek the unseen Aslan's Country as his last voyage. Pegg replaced Eddie Izzard because director Michael Apted thought that his voice is more mature and serious than Izzard's. Gary Sweet as Lord Drinian: Drinian is the captain of the Dawn Treader and Caspian's best friend. He is a very cautious and protective captain, and is somewhat superstitious about stories of sea serpents. Shane Rangi as Tavros: Rangi also played Asterius in Prince Caspian and General Otmin in The Lion, The Witch, and the Wardrobe. Liam Neeson as Aslan (voice): Aslan is a great lion and the highest of all the Kings of Narnia. He tests everyone's faith as they embark on a voyage to defeat evil and to seek his country in the ends of the world. He later guides Reepicheep to his own country. Tilda Swinton as White Witch: A former queen of Charn who ruled Narnia after the events of The Magician's Nephew and during the events of The Lion, the Witch and the Wardrobe until she was killed by the great lion, Aslan. Aboard the Dawn Treader, Edmund's memories of her are revived by the Green Mist which manifest into her image to torment him in his test to overcome his fears. Laura Brent as Lilliandil: Lilliandil is the daughter of the retired star, Ramandu and the Blue Star that shines over Ramandu's Island; the crew on the Dawn Treader follow her position in the sky to reach the island. She aides the crew in destroying the evil of Dark Island and is also Caspian's love interest. The name of Ramandu's daughter is not mentioned in the novel; Douglas Gresham, Lewis's stepson and literary executor, and an executive producer of the film, coined the name "Lilliandil". Bille Brown as Coriakin: Coriakin is a wizard and a retired star who guides the Dufflepuds to wisdom. He reveals to the crew the evil that threatens to corrupt Narnia and warns them that each one of them will be tested in their faith by Aslan. Terry Norris as Lord Bern: Bern is one of the Lost Lords of Narnia who settled on the Lone Islands. He later succeeds as its new Governor. Bruce Spence as Lord Rhoop: Rhoop of the Lost Lords of Narnia. He gets trapped on the Dark Island. Arabella Morton as Gael: Gael is a Lone Islander whose mother was sacrificed to the green mist. She later sneaks on board the Dawn Treader to follow her father (Rhince, played by Arthur Angel), who also joins the Dawn Treader crew to look for his wife. She is good friends with Lucy and sees her as her heroine, as Lucy acts much like a big sister to her. Nathaniel Parker as Caspian IX and the Green Mist in his form: The late father of Caspian X, who was murdered by his brother Miraz shortly after his son's birth. The Green Mist of Dark Island appears to Caspian as his father, telling him that he is ashamed to call him his son. William Moseley as Peter Pevensie: Peter is the oldest of the Pevensie children, who was crowned as the High King of Narnia during the events of The Lion, the Witch and the Wardrobe. He was too old to experience the wonders of Narnia after the events of Prince Caspian. Anna Popplewell as Susan Pevensie: Susan is the second-oldest of the Pevensie children and a Queen of Narnia. She was too old to visit Narnia a third time along with her older brother Peter. She went to America with her parents, leaving her younger siblings to spend a not-so-fun holiday with their cousin Eustace. Douglas Gresham as a slave buyer: Douglas Gresham is the stepson of C. S. Lewis and made cameo appearances in all three Narnia films, all of which he co-produced/executive produced. Colin Moody as Pug, a slave-trader. Michael Apted took over as the film's director from Andrew Adamson, who opted to produce, with Mark Johnson, Perry Moore, and Douglas Gresham. Steven Knight wrote the script following a draft by Christopher Markus and Stephen McFeely. Richard Taylor, Isis Mussenden, and Howard Berger continued their roles working on the production design and practical effects, while visual effects supervisor Jim Rygiel, composer David Arnold, and cinematographer Dante Spinotti are newcomers to the series. The film was officially budgeted at $140 million, although some estimates put the cost at $155 million. When Apted signed on to direct The Voyage of the Dawn Treader in June 2007, filming was set to begin in January 2008 for a May 1, 2009 release date. Shooting would have begun in Malta, and then moved to Prague and Iceland. A few months later, Disney announced that "in consideration of the challenging schedules for [its] young actors", they were delaying the release date to May 7, 2010, and filming was moved to October 2008. Johnson rescheduled the shoot to Playas de Rosarito, Baja California (Mexico), where two-thirds of the film would be shot at the water tank that was used for Titanic and Master and Commander: The Far Side of the World. Filming was also scheduled for Australia. Disney and Walden eventually grew concerned over safety in Mexico, and Australian officials at Warner Roadshow Studios in Queensland offered to become the project's base for the whole shoot. Disney announced on December 24, 2008 that they will not be distributing the film, due to a budget dispute with Walden over the box office performance of Prince Caspian, which grossed far less than The Lion, the Witch and the Wardrobe; Disney wanted to limit it to $100 million, whereas Walden wanted a $140 million budget, of which Disney would only need to provide half. Another reason why Disney opted not to produce the film was because they feared the budget would only grow during filming and post-production. The Los Angeles Times also reported "creative differences" led to the split. Times columnist Mary McNamara noted that Disney leaving the series could be a mistake, because Voyage is the most popular Narnia book, while Caspian was the series' least popular and did not create the anticipation surrounding the first film. Walden had to find a new distributor for the film. Several other studios, including Sony's Columbia Pictures, Paramount Pictures, Universal Pictures, Warner Bros., and 20th Century Fox were in negotiations to distribute the film, although several markets already predicted that Fox would take over. It was announced in January 2009 that Walt Disney Pictures would be replaced by 20th Century Fox as the distributor, although Disney would continue to retain the distribution rights for the first two. Fox had pursued the Narnia film rights in 2001 and distributed other Walden projects. Producer Mark Johnson admitted that "we made some mistakes with Prince Caspian and I don't want to make them again." He said it was "very important" that filmmakers regain the magic for Dawn Treader. Michael Petroni was hired to rewrite the script with Christopher Markus & Stephen McFeely, following a draft written by Richard LaGravenese and Steven Knight. The previous two films have been described as remaining more faithful to the original stories than the third installment. Apted noted the episodic and disconnected nature of the story would need to be revised for a film version, such as the material involving the Dark Island, the Sea Serpent, and Eustace. They even discussed combining The Voyage of the Dawn Treader with The Silver Chair, much as the BBC combined Dawn Treader and Prince Caspian in its television serial. As a result, some elements were borrowed from The Silver Chair, where Narnians are held hostage and rescued. The author's estate did not initially receive the change well, but it gained favor after review. Eustace has a greater role as a dragon in the film such as not only allowed to proceed with the ship to the next islands in that state, but also proves a valuable asset for the crew for the remainder of the voyage. This is so he could take a major part in the action and not merely do expedition work duty as in the book. The book's stream of consciousness description about Eustace gradually realizing that he had become a dragon while sleeping is effective as text, but it could not easily be translated onto film. Further, a noted passage from the book where Aslan peels Eustace's dragon skin off in layers is not used. Walden President Micheal Flaherty remarked about it that "people don't earn grace; they receive it once they are humbled and aware of their need." The old dragon which Eustace finds, and sees it die of old age, in the valley in the book, is not used in the film. Ernie Malik, a unit publicist for the film, confirmed that filming began on July 27, 2009, on location in Queensland, Australia. Filming took place at Village Roadshow Studios in August and September 2009, with filming of exterior shots on board the ship at Cleveland Point and the Gold Coast Seaway in September 2009. Apted stated that fellow directors Gore Verbinski and Peter Weir recommended him not to shoot on water, so they built a giant Dawn Treader on a gimbal, which allowed it to rock and shift as if on the high seas. At the extreme end of the town's peninsula, jutting into Moreton Bay, the 145-tonne (160-ton) boat could be rotated through 360 degrees to keep the sun angles consistent. Additional shots were taken at The Southport School, also located on the Gold Coast. It was also filmed at White Island in New Zealand. Filming concluded in November. There are 1,400 special effects shots that were made for The Voyage of the Dawn Treader, more than The Lion, the Witch and the Wardrobe's 800 and fewer than Prince Caspian's 1,500 shots. Angus Bickerton served as the lead visual effects supervisor of the film while Jim Rygiel, who supervised the effects on the Lord of the Rings film trilogy, worked as the senior visual effects supervisor. British visual effects companies the Moving Picture Company, Framestore CFC, and The Senate VFX were hired to create the visual effects alongside Cinesite and The Mill. Moving Picture worked on the dragon Eustace and the Dawn Treader. They say the dragon is "amongst the most heroic characters ever created, and is scheduled to be featured in around 200 shots of the movie." They also revised Reepicheep from the previous film by saturating his color, giving him bushier eyebrows and ear hair, and made his whiskers a little more wiry just to give him a sense of age. Framestore also revised Aslan, changing his color palette to be a more realistic lion than a golden lion and adding a darker mane; they also created 16 different dufflepuds to replace Jonathan Fawkner and Angus Bickerton running around first as dufflepuds on the set; The Senate worked on the opening shot of King's College, Cambridge, as well as the star effect on Liliandil at Ramandu's Island; Cinesite worked on the Dark Island, and Fugitive Studios did the end titles and credits, which featured original drawings created by Pauline Baynes for the Narnia books. These illustrations were included because the film's creators wanted the credits to have visual interest, and also because they wished to include an acknowledgement to Baynes, who died in August 2008. "Well, the thing about us is that we have a long time. We decided in February  to make Dawn Treader a 3D movie, so we had nine months to do it. Some of these other films put 3D in very quickly. I believe something like Clash of the Titans had about eight weeks. So we have had time to think about it, so it hasn't been a rush. I think we'll get very good value out of it. They won't see anything cheap or nasty. Rest assured on that." After the success of the 3D release of Avatar, 20th Century Fox announced in February 2010 that The Voyage of the Dawn Treader would be released in Digital 3D and RealD 3D formats; it is the first Narnia film to have a 3D release. Walden had previous experience creating 3D films, having released James Cameron's documentaries Ghosts of the Abyss and Aliens of the Deep, as well as Journey to the Center of the Earth with New Line Cinema. The filmmakers initially discussed shooting the film in 3D during principal photography but later decided to shoot in two-dimensional cameras to save on costs. Prime Focus Group was hired in June 2010 to convert the film to 3D during post-production. Film director Joe Dante remarked that Apted was at first skeptical about the conversion, stating "If I was gonna do a 3D movie, I would have done it differently." Later, he remarked that he was excited after seeing progress during the conversion. Dawn Treader was his first 3D film. Johnson later said that the reason for the film's 3D release was to help Dawn Treader at the box office, where it would be in competition with films such as Tangled, Tron: Legacy, and Yogi Bear which were released in 3D. Composer David Arnold scored the film, with themes composed by Harry Gregson-Williams (who scored the first two films). It was the Arnold's fourth collaboration with Apted, after The World Is Not Enough, Enough, and Amazing Grace. Arnold worked with Paul Apted in editing the score, which he said was "going to be epic." The scoring sessions took place during September and work was completed on October 8, 2010. An original song, "There's a Place for Us" written by Carrie Underwood, David Hodges, and Hillary Lindsey, and recorded by Carrie Underwood, was released on November 16, 2010 exclusively on iTunes. It was released on December 7, 2010 by Sony Masterworks. Covers of the song have been recorded by various singers around the world for international releases of the film. In addition to its production budget, Fox and Walden spent around $100 million to promote the film around the world. In late November 2009, three still pictures from the film were released on the social networking site Facebook. In February 2010, Narnia.com, the official domain, returned after a nine-month hiatus, bringing exclusive reports from the set. The full site, with the first trailer, information on the film's story and cast, and other content, opened on June 17, 2010. The film's first promotional banner was presented at the 2010 Cannes Film Festival, which was followed by a teaser poster in May 2010. A Christian Narnia conference was held from June 3–6, 2010, at Taylor University in Upland, Indiana. Director Michael Apted and some of the producers gave exclusive commentary on and first looks at the film, including a 5-minute "super trailer". Franklin Graham's Samaritan's Purse program promoted an international relief campaign entitled Operation Narnia to donate relief goods to children around the world from July to December 2010. The historic caravel ship The Matthew was transformed into a replica of The Dawn Treader to promote the film. It sailed from the Atlantic Ocean to the English Channel in August 2010. National Geographic Channel and Fox conducted a series of contests in Europe for people who want to visit the ship for three days. The National Maritime Museum in Cornwall made the ship available to the public on August 28 to August 30, 2010. "It's a story that has English roots but its relatable to every child on the planet because its about growing up, finding yourself, coming to terms with yourself and knowing what your values are." IGN said that the film "was far more reminiscent of the vibrant and optimistic The Lion, the Witch, and the Wardrobe than of its dark and violent sequel, Prince Caspian". UGO said that "Narnia's gone back to the magic" and remarked that "sailing the high seas looks fun!" The first official trailer for the film was released online on June 17, 2010. The trailer was attached to the theatrical release of Toy Story 3 on June 18, 2010. and then attached to Alpha and Omega on September 17, 2010. 20th Century Fox released the trailer on the Diary of a Wimpy Kid DVD release. An international poster and trailer for the film was shown on October 7, 2010. A third trailer was released November 9, 2010. To promote the film's release, American television networks ABC and Disney Channel broadcast The Lion, The Witch and the Wardrobe on December 11, 13, and 14. Cable network Syfy screened Prince Caspian on December 12 and 13. HarperCollins published new editions of The Voyage of the Dawn Treader and The Chronicles of Narnia on October 26, 2010, with new images of the film. Harper published a new edition of The Chronicles of Narnia, commemorating the 60th anniversary of The Lion, the Witch, and the Wardrobe, and released it the same day. A movie storybook and several other tie-in books were released by HarperChildrens, Walden Pond Press, and Zondervan to promote the film. On November 12, 2010, HarperCollins released an enhanced multimedia e-book of The Voyage of the Dawn Treader for several platforms including iPad and Android. Group Publishing released three previews from the film and included it in their vacation Bible school resource kit called Fun for the Whole Family Hour on August 19, 2010. Grace Hill Media released a resource tool entitled Narnia Faith for ministers and pastors on October 12, 2010. Nihilistic Software and Disney Interactive Studios was supposed to develop a video game based on the film for Xbox 360, PlayStation 3, and Wii when Disney was still involved in the project. But when Fox took over the production, Nihilistic sought out negotiations with Fox Digital Entertainment division. They failed to agree on a settlement, which resulted in the cancellation of the video game. Fox Digital Entertainment later collaborated with Gameloft to produce a mobile game for iPhone and iPod Touch which was released on November 18, 2010. The Voyage of the Dawn Treader held its world premiere on November 30, 2010 in London at the Royal Film Performance in Leicester Square. It was the first time the Royal Film Performance was screened in Digital 3D and the second time a Narnia film premiered at the event, the first being The Lion, the Witch, and the Wardrobe in 2005. The premiere was attended by various personalities, including Queen Elizabeth II and Prince Philip. It was given a pre-release gala on December 8 in Knoxville, Tennessee followed by a North American premiere in Louisville, Kentucky on December 9, 2010. The film was originally set to have a May 2009 release date when Disney was still producing it. ; a May 7, 2010 release date was also announced in early 2009, soon after Disney left the project. But the film was later delayed when Disney pulled itself and Fox helmed the production. Fox later announced a December 2010 release date because it felt that Narnia will do better during the holidays. It had its major release in Digital 3D, RealD 3D, and 2D formats in Asia and Australia on December 2, 2010 and in North America and Europe on December 10, 2010. Brandon Gray of Box Office Mojo stated that "There certainly will be an audience for this picture, I just don't think it is going to restore the franchise to its former glory." He added that the film would be considered a relative success if it made anything close to Prince Caspian's box office numbers, which would increase the likelihood of further Narnia films. "They got a little careless by taking the faith group for granted—and by neglecting it paid the price. We realized we can't make the same mistake. We've got to sell the film to everybody." Mark Johnson, the producer of the Narnia films, later remarked that Prince Caspian "had strayed from its core audience," referring to the Christian and family audience who catapulted The Lion, the Witch, and the Wardrobe to the top at the box office. Tom Rothman, co-chairman of Fox Filmed Entertainment, remarked, "We think this is a tremendously undervalued asset, we believe there is great life in the franchise." He feels the film is not just a single motion picture, but a re-launch of a movie series that still has long-term potential. He commented that Fox and Walden had engaged in talks about further potential Narnia films, though such discussions were made prior to the opening of Dawn Treader. 20th Century Fox Home Entertainment released The Chronicles of Narnia: The Voyage of the Dawn Treader on Blu-ray and DVD on April 8, 2011. The release included a single-disc DVD, a two-disc DVD double pack, a single-disc Blu-ray, and a three-disc Blu-ray with DVD and Digital Copy. The two-disc DVD double pack will feature an animated short film entitled The Untold adventures of the Dawn Treader, a guide to the Dawn Treader, seven featurettes aired on Fox Movie Channel and 5 minutes of deleted scenes. The three-disc Blu-ray edition will also feature 8 international music videos, a sword game, five Island explorations, two additional short films entitled Portal to Narnia: A Painting Comes to Life & Good vs. Evil: Battle on the Sea, a visual effects progression reel, and a digital copy. 20th Century Fox, have announced that the 3D Blu-ray will be released in the US on August 30, 2011. Walden Media President Micheal Flaherty stated in an interview that 20th Century Fox Home Entertainment and Walt Disney Studios Home Entertainment are developing a collector's edition box-set DVD and Blu-ray containing the first three films. The film grossed $415,686,217 worldwide, including $104,386,950 in North America as well as $311,299,267 in other territories. It is the 12th-highest-grossing film worldwide of 2010, as well as Fox's highest-grossing film of that year since, ahead of Knight and Day and Percy Jackson & the Olympians: The Lightning Thief. The Voyage of the Dawn Treader opened in 3,555 theaters across the United States and Canada on December 10, 2010. On its opening day, the film grossed $8.3 million, which was far lower than the $23.0 million that The Lion, the Witch, and the Wardrobe made on its opening day in 2005, and also much lower than Prince Caspian, which had an opening-day gross of $19.4 million in 2008. Although The Voyage of the Dawn Treader debuted at #1 at the box office and grossed $24.0 million for its opening weekend, it was far less than the opening weekends of The Lion, the Witch and the Wardrobe ($65.6 million) and Prince Caspian ($55.0 million). Despite The Voyage of the Dawn Treader's disappointing opening weekend, Fox believed that word of mouth and the holiday season would help the film hold well. In its second weekend, The Voyage of the Dawn Treader dropped 48%, the smallest second-weekend drop in the franchise, and came in with $12.4 million, in third place to Tron: Legacy and Yogi Bear. During its third weekend, the 2010 Christmas weekend, The Voyage of the Dawn Treader dropped only 24%, the smallest decline among nationwide releases, and grossed $9.5 million. In the 2011 New Year's weekend, the film increased 8% from the previous weekend, grossing $10.3 million. On January 22, 2011, the film's forty-fourth day in theaters, The Voyage of the Dawn Treader became 20th Century Fox's first film to gross $100 million in the United States and Canada since Alvin and the Chipmunks: The Squeakquel crossed that mark in December 2009. However, it is the slowest Narnia film to reach $100 million in these regions, taking much longer than The Lion, the Witch and the Wardrobe (nine days) and Prince Caspian (thirteen days). Overseas, the film performed better. On its limited opening weekend (Dec. 3–5, 2010) when it opened in only 9 territories (among them some limited releases), it earned $11.9 million ranking 4th for the weekend. On its first weekend of wide release (Dec. 10–12, 2010), it expanded to 58 countries and topped the box office, earning $65.8 million, for an overseas total of $79.8 million. The film's biggest opening market was Russia, where it opened with $10.9 million (the best start for the franchise) including previews. It had the best opening of for a Narnia film in Mexico ($7.1 million including previews) and South Korea ($5.3 million including previews). Its opening in the UK, a mere $3.9 million, was less than half of what Prince Caspian opened with and about a quarter of the first film's UK opening in 2005. However, the film held well throughout the holiday season in the UK, and on the weekend ending January 9, 2011 it outgrossed the £11,653,554 that Prince Caspian made in that region. It made £14,317,168 ($23,650,534) at the UK box office. On its second weekend, it held to the top spot at the box office, but declined 53% to $31.2 million for an overseas total of $125.2 million. It fell to fifth place on the Christmas weekend ($23.1 million) and on New Year's weekend it went down to sixth place ($19.3 million) for an overseas total of $210.2 million. It eased 5% to $18.4 million from 53 markets on its fifth showing for a fourth-place finish. It had a major opening of $6.3 million in China, which was better than Prince Caspian's $3.9 million. On its 12th weekend (February 25–27), it surpassed Prince Caspian's foreign gross ($278 million) when it opened in Japan, with a $6.6 million gross, which is behind the first film's opening ($8.9 million) but better than the second film's ($5 million). Film review aggregator Rotten Tomatoes reports an approval rating of 50% based on 160 reviews, with a rating average of 5.7/10. The site's critical consensus reads, "Its leisurely, businesslike pace won't win the franchise many new fans, but Voyage of the Dawn Treader restores some of the Narnia franchise's lost luster with strong performances and impressive special effects." On Metacritic, which assigns a weighted mean rating from film critics, the film has a weighted average score of 53 out of 100 based on 33 critics, indicating "mixed or average reviews". CinemaScore polls conducted during the opening weekend revealed the average grade audiences gave the film an "A-" on an A+ to F scale. "Henley and Keynes are charming as ever, and Poulter's turn as Eustace injects a welcome note of comedic cynicism into the sea of sentimentality. Simon Pegg ably succeeds Eddie Izzard as mouse warrior Reepicheep, Bille Brown's sorcerer Coriakin has a fun performance and a sequence in which Lucy inadvertently wishes her life away is brilliantly disorienting and nightmarish." Less positive reviews include Justin Chang of Variety, who said, "this f/x-heavy third adaptation of the Christian-themed fantasy series feels routine and risk-averse in every respect, as if investment anxiety had fatally hobbled its sense of wonder". "Lewis embedded his engrossing, popular fantasies with child-size lessons in virtue, served with an overlay of Christian allegory for those who wish to seek it. What's less expected is that the movie, directed by Michael Apted (taking over from a more sprightly, fantasy-savvy Andrew Adamson, who handled the first two, along with the first two Shreks), looks and feels so wooden, so cheesy. The action sequences are full of dutifully tricky, chessboard fighting lunges and sword swings; the talking special-effects mouse, Reepicheep (previously voiced by Eddie Izzard, now by Simon Pegg), talks a lot." Amy Biancolli of the San Francisco Chronicle also gave the film an unfavorable review and called it, "the third and most uneven film adaptation in the series." With the introduction of the quest for the seven swords, a reappearance of the White Witch, and a larger role for Eustace in dragon form, the movie adaptation attempts to appeal to Everyman and not just to Lewis fans and Christian audiences. Nonetheless, Christian reviewers found much to like. Key for many was the closing scene where Aslan assures Lucy that he is indeed in her own world, where he has another name, and that she was brought to Narnia so that she might come to know him better in her own world. This contrasts with the reception of the first two Narnia films, which Christian reviewers felt lacked key incidents and themes from the corresponding books, The Lion, the Witch and the Wardrobe and Prince Caspian. On 14 December 2010, The Hollywood Foreign Press Association nominated The Voyage of the Dawn Treader for the Golden Globe Award for Best Original Song ("There's a Place for Us") at the 68th Golden Globe Awards. It received three nominations at the Phoenix Film Critics Society Awards: Best Youth Actor (Will Poulter), Best Live Action Family Film, and Best Original Song. Poulter received a nomination for Young British Performer of the Year at the 2010 London Film Critics Circle Awards. The film also received four nominations at the 37th Saturn Awards. It was awarded the Epiphany Prize as the Most Inspiring Movie of 2010. On February 27, 2011, it was announced that The Magician's Nephew would be the next film in the series. The C. S. Lewis Estate were in final negotiations to produce it and were yet to confirm a release date and screenwriter. However, in October 2011, Douglas Gresham, a co-producer of the films, said that Walden Media no longer owns the rights to produce another Narnia film. If another film were to be made, it would not be for another three or four years. On October 1, 2013, it was announced that the Mark Gordon Company would produce The Chronicles of Narnia: The Silver Chair, now officially in development as the fourth film in the franchise. While the film's producers have been calling the film a "reboot" to the series, in actuality this is referring to the fact that the film is a new franchise, and has a new cast and creative team not associated with those who worked on the previous three films. In April 2017, Joe Johnston was confirmed as the planned director for The Silver Chair. ^ a b Mike Collett-White (November 29, 2010). "Will Narnia blockbuster sink or sail?". Reuters. Retrieved December 2, 2010. Mark Johnson, a producer on all three Narnia films, told the Wall Street Journal that the new movie was made for a relatively modest $140 million. ^ a b "Company Town: 'Dawn Treader's' foreign appeal". Ben Fritz. L.A. Times. December 13, 2010. Retrieved December 27, 2010. ^ a b c d "The Chronicles of Narnia: The Voyage of the Dawn Treader". Box Office Mojo. boxofficemojo.com. December 19, 2010. Retrieved December 19, 2010. ^ "South Korea to See 'Dawn Treader' in 4D". Narniaweb.com. Retrieved December 2, 2010. ^ a b "Voyage of the Dawn Treader film chosen for royal gala". BBC News. August 16, 2010. Retrieved August 18, 2010. ^ a b 2010 Yearly Box Office Results. Box Office Mojo. Retrieved January 28, 2011. ^ "Narnia 4 Will Be 'Magician's Nephew,' Not 'Silver Chair'". Christian Post. ^ a b "Security Check Required". ^ a b "Walden Media's Option for a Fourth Narnia film Expires". Christian Cinema. October 18, 2011. ^ a b c d e f g h i j k l m n o "Cast: The Voyage of the Dawn Treader". NarniaWeb.com. Retrieved November 23, 2010. ^ Tirian. "Simon Pegg Replaces Bill Nighy as the Voice of Reepicheep". NarniaWeb.com. Retrieved November 23, 2010. ^ "Meet Narnia's Chief Dufflepud". Cinemablend. August 14, 2009. Retrieved November 27, 2010. ^ a b Paul Martin (May 22, 2010). "Voyage of the Dawn Treader Display Photos [Updated – High Res!]". Narnia Fans. Retrieved November 27, 2010. ^ "The Voyage of the Dawn Treader Crew Listing". NarniaWeb. Retrieved December 14, 2008. ^ a b Peter Gilstrap (June 19, 2007). "Apted to direct 'Narnia' sequel". Variety. Reed Business Information. Retrieved November 27, 2010. ^ "Dawn Treader Locations". NarniaWeb. September 9, 2007. Retrieved September 9, 2007. ^ "Next Narnia Delayed". IGN. September 19, 2007. Retrieved September 19, 2007. ^ Paul Martin (February 15, 2008). "Douglas Gresham Interview on Prince Caspian, Voyage of the Dawn Treader". NarniaFans. Retrieved April 21, 2008. ^ Edward Douglas (April 19, 2008). "Dawn Treader Starts Shooting in October". ComingSoon.net. Retrieved April 21, 2008. ^ Marc Graser (July 2, 2008). "'Narnia' to be found in Mexico". Variety. Reed Business Information. Retrieved July 2, 2008. ^ Emily Dunn and Garry Maddox (December 18, 2008). "Narnia says nah to Mexico". The Sydney Morning Herald. Retrieved December 18, 2008. ^ Jim Hill (November 17, 2008). "Monday Mouse Watch: Waiting for the "Dawn"". Jim Hill Media. Retrieved December 14, 2008. ^ Claudia Eller (December 25, 2008). "Disney pulls out of next 'Narnia'". Los Angeles Times. Retrieved January 1, 2009. ^ Mary McNamara (January 1, 2009). "A 'Chronicles of Narnia' voyage Disney should take". Los Angeles Times. Retrieved January 1, 2009. ^ "Disney opts out of 3rd 'Narnia' film". Biz Journals. December 29, 2008. Retrieved November 27, 2010. ^ "Will 'The Dawn Treader' Float?". Christianity Today. Retrieved March 9, 2010. ^ Tatiana Siegel (February 26, 2009). "Next 'Narnia' writer tapped". Variety. Reed Business Information. Retrieved February 27, 2009. ^ a b c Collett-White, Mike (December 10, 2010). "Director Michael Apted takes movie fans to "Narnia"". Reuters UK website. Reuters. Retrieved December 12, 2010. ^ Michael Fleming, Tatiana Siegel (January 28, 2009). "Fox to develop 'Narnia'". Variety. Reed Business Information. Retrieved January 29, 2009. ^ a b Grabert, Jessica (December 10, 2010). "10 Big Differences Between Narnia: Voyage Of The Dawn Treader Book And Movie". Cinema Blend. Cinema Blend LLC. Retrieved December 12, 2010. ^ "Dawn Treader Plot Details". NarniaWeb. December 10, 2010. Retrieved December 12, 2010. ^ Aslan's Country (July 27, 2009). "The Mysterious Filming Date... Confirmed". Aslan's Country. Retrieved January 9, 2010. ^ Mitchell, Wendy (July 28, 2009). "Apted starts Australian shoot for Narnia: Voyage Of The Dawn Treader". Screen International. Emap Media. Retrieved July 28, 2009. ^ Peter Scott (November 6, 2009). "Chronicles of Narnia: Voyage of the Dawn Treader". Mornings with Madonna King. Australian Broadcasting Corporation. Archived from the original on November 22, 2009. Retrieved November 8, 2009. ^ Lewis, Marcia (August 8, 2009). "Stars, crew love Coast". The Courier-Mail. News Corporation. Retrieved August 8, 2009. ^ "Narnia film to be shot at White Island". nzherald.co.nz. December 20, 2009. ^ "Filming Wraps on The Voyage of the Dawn Treader". NarniaWeb. Retrieved February 10, 2018. ^ Paul Martin (April 11, 2010). "The Voyage of the Dawn Treader CGI – Effects Houses are Busy". Narnia Fans. Archived from the original on June 15, 2010. Retrieved December 17, 2010. ^ a b K. C. Morgan (September 30, 2010). "First Look: Voyage of the Dawn Treader". Gear Live. Retrieved November 27, 2010. ^ a b Edward Douglas (September 28, 2010). "The Chronicles of Narnia: The Voyage of the Dawn Treader Presentation". Coming Soon. Retrieved November 27, 2010. ^ "Dante digs being busy once again". Herald.ie. September 21, 2010. Retrieved December 9, 2010. ^ "Simon Pegg Voices Discontent with 3-D". Aslan's Counrry. September 28, 2010. Retrieved December 9, 2010. ^ "Arnold Recording the VDT Score". NarniaWeb. September 3, 2010. Retrieved November 27, 2010. ^ "Carrie Underwood is the featured artist in the Voyage of the Dawn Treader". Carrie Underwood. November 14, 2010. Retrieved November 27, 2010. ^ "New Carrie Underwood Song For 'Chronicles of Narnia' Hits iTunes 11/16". MJ's Bigblog. October 29, 2010. Retrieved November 27, 2010. ^ "Carrie Co-Writes & Records Title Song For "The Chronicles Of Narnia"!". Carrie Underwood. November 1, 2010. Archived from the original on December 30, 2010. Retrieved November 27, 2010. ^ Mansfield, Brian (November 1, 2010). "Carrie Underwood 'Narnia' track available Nov. 16". USA Today. Retrieved November 27, 2010. ^ a b Los Angeles Times (December 1, 2010). "Producers hope 'Dawn Treader' has magic of first 'Narnia' film". LAtimes.com. Retrieved December 7, 2010. ^ "Dedicated to the Ones He Loves". Facebook. December 16, 2009. Retrieved November 27, 2010. ^ "Narnia.com Returns". NarniaWeb. February 3, 2010. Retrieved November 27, 2010. ^ "The First Dawn Treader Movie Poster". NarniaWeb. May 14, 2010. Retrieved November 27, 2010. ^ "About". Operation Narnia. Retrieved November 27, 2010. ^ "First Look at the Matthew as the Dawn Treader". NarniaWeb. Retrieved November 27, 2010. ^ "Italian Narnia Fans: Win a Trip to Sail on the Dawn Treader". NarniaWeb. July 12, 2010. Retrieved November 27, 2010. ^ "Chronicles of Narnia boat arrives in Padstow". BBC News. July 26, 2010. Retrieved October 16, 2010. ^ Jim Vejvoda (September 30, 2010). "Come Aboard the Dawn Treader". IGN.com. Retrieved October 16, 2010. ^ Mark Patches (September 30, 2010). "6 Realizations After Watching New Narnia: Dawn Treader Footage". UGO.com. Archived from the original on October 5, 2010. Retrieved October 16, 2010. ^ "'The Voyage of the Dawn Treader' Trailer is Here!". NarniaWeb. June 17, 2010. Retrieved November 27, 2010. ^ "The Chronicles of Narnia: The Voyage of the Dawn Treader-Spectacular trailer". Filmissimo. Retrieved November 10, 2010. ^ "The Chronicles of Narnia 60th Anniversary Edition". HarperCollins. Archived from the original on August 30, 2010. Retrieved November 27, 2010. ^ "The Voyage of the Dawn Treader Movie Tie-in Edition". HarperCollins. Archived from the original on October 17, 2010. Retrieved November 27, 2010. ^ "The Voyage of the Dawn Treader Movie Storybook". HarperCollins. March 24, 2010. Retrieved November 27, 2010. ^ Tim Carmody (November 12, 2010). "Enhanced Narnia E-Book Has Promise, Restrictions". Wired. Retrieved November 19, 2010. ^ CNN (November 12, 2010). "Narnia's 'Dawn Treader' sails enhanced e-book wave". CNN.com. Retrieved November 19, 2010. ^ "iBooks: The Voyage of the Dawn Treader (Enhanced Version)". Apple Inc. October 26, 2010. Retrieved November 27, 2010. ^ Matthew Reynolds (August 19, 2010). "Three New Video Clips from Voyage of the Dawn Treader [Updated]". AslansCountry. Retrieved November 27, 2010. ^ "Narnia-Inspired Resources for People of Faith". Narnia Faith. Retrieved November 27, 2010. ^ "The Voyage of the Dawn Treader Video Game Has Been Cancelled!". NarniaWeb. July 12, 2010. Retrieved November 27, 2010. ^ "The Chronicles of Narnia: The Voyage of the Dawn Treader for Mobile". Gameloft. Retrieved November 27, 2010. ^ "New Narnia Film Gets Royal Approval". Sky News. November 30, 2010. Retrieved December 1, 2010. ^ Bull, Sarah (November 30, 2010). "Where's the White Witch when you need her? Chronicles Of Narnia stars Georgie Henley and Anna Popplewell brave the snow for Voyage Of The Dawn Treader premiere". London: Daily Mail UK. Retrieved December 1, 2010. ^ "Dawn Treader to Get Two Premieres in the US — First in Knoxville, TN". NarniaWeb. November 12, 2010. Retrieved November 27, 2010. ^ Naman Ramachandran (November 14, 2010). "'Narnia' to get record release in India". Variety. Reed Business Information. Archived from the original on October 31, 2011. Retrieved November 27, 2010. ^ Mike Collett-White (December 1, 2010). "Will Narnia blockbuster sink or sail, pundits ask". Reuters. Retrieved December 7, 2010. ^ Brooks Barnes (December 1, 2010). "Studios Battle to Save Narnia (From Grip of Sequel Fatigue)". The New York Times. Retrieved December 7, 2010. ^ Liam Goodwin. "The Chronicles of Narnia: The Voyage of the Dawn Treader DVD and Blu-ray set for April". Filmonic. ^ David McCutcheon (February 1, 2011). "Chronicles of Narnia: Voyage of the Dawn Treader Sails to DVD and Blu-ray". IGN. ^ "Voyage Of The Dawn Treader Casts Off Into Blu-Ray Waters". ^ "Amazon.com: The Chronicles of Narnia: The Voyage of the Dawn Treader [Blu-ray]: Ben Barnes, Skandar Keynes, Michael Apted: Movies & TV". ^ "The Chronicles of Narnia: The Voyage of the Dawn Treader Blu-ray Announced". Blu-ray.com. ^ "3D Blu-rays of Rio, Ice Age 3 and The Chronicles of Narnia: Voyage of the Dawn Treader Announced". Blu-ray.com. ^ "The Chronicles of Narnia: The Voyage of the Dawn Treader". Hollywood Jesus Live. ^ "Friday Report: Third 'Narnia' Flounders, 'Tourist' Doesn't Sizzle". Boxofficemojo.com. December 11, 2010. Retrieved December 17, 2010. ^ "'Narnia" cruises to No. 1 debut with modest $24.5M (AP)". Movies.yahoo.com. December 12, 2010. Retrieved December 17, 2010. ^ Young, John (December 12, 2010). "Box office report: 'Narnia' underperforms but finishes first with $24.5 mil". Insidemovies.ew.com. Retrieved December 17, 2010. ^ "Weekend Report: 'Tron' Recycles the Power". ^ "Weekend Report: 'Fockers' Fester, 'Grit' Has Gumption". ^ "Box office report: 'Little Fockers' wins New Year's weekend with $26.3 mil, 'True Grit' close behind". Entertainment Weekly's EW.com. ^ "'Narnia' Becomes Fox's First $100 Million Movie in 13 Months". ^ "Overseas Total Box Office". Retrieved March 19, 2011. ^ Subers, Ray (December 15, 2010). "Around-the-World Roundup: 'Dawn Treader' Makes Waves Overseas". boxofficemojo.com. Amazon.com. Retrieved January 4, 2011. ^ "Page Not Found - UCA". Archived from the original on January 21, 2011. ^ "The Chronicles of Narnia: The Voyage of The Dawn Treader". ^ Subers, Ray (December 15, 2010). "Around-the-World Roundup: 'Dawn Treader' Crashes, 'Tron' Starts in Third". boxofficemojo.com. Amazon.com. Retrieved January 4, 2011. ^ "Overseas Total Box Office". Box Office Mojo. Retrieved March 19, 2011. ^ "China Box Office". Box Office Mojo. Retrieved March 19, 2011. ^ "Around-the-World Roundup: 'Number Four' Edges Out 'Swan'". ^ "The Chronicles of Narnia: The Voyage of the Dawn Treader Movie Reviews, Pictures". Rotten Tomatoes. Retrieved January 14, 2011. ^ Metacritic (December 9, 2010). "The Chronicles of Narnia: The Voyage of the Dawn Treader (2010) – Metacritic review". CBS Interactive. Retrieved December 10, 2010. ^ "Company Town". Los Angeles Times. ^ Roger Ebert (December 9, 2010). "The Chronicles of Narnia: The Voyage of the Dawn Treader (2010) – RogerEbert.com :: review". Chicago Sun-Times. Retrieved December 10, 2010. ^ Roger Moore (December 9, 2010). "Movie Review: The Chronicles of Narnia-The Voyage of the Dawn Treader". Orlando Sentinel. Archived from the original on December 11, 2010. Retrieved December 10, 2010. ^ Andrew Pulver (December 1, 2010). "The Chronicles of Narnia: The Voyage of the Dawn Treader — review". London: The Guardian. Retrieved December 2, 2010. ^ Jim Vejvoda (December 9, 2010). "The Chronicles of Narnia-The Voyage of the Dawn Treader review". IGN. Retrieved December 10, 2010. ^ Kerry Lengel (December 9, 2010). "The Chronicles of Narnia-The Voyage of the Dawn Treader review". Variety. Reed Business Information. Archived from the original on December 11, 2010. Retrieved December 10, 2010. ^ Justin Change (December 9, 2010). "Review: The Chronicles of Narnia-The Voyage of the Dawn Treader". Variety. Reed Business Information. Archived from the original on December 11, 2010. Retrieved December 10, 2010. ^ Lisa Schwarzbaum (December 15, 2010). "Movie Review The Chronicles Of Narnia: The Voyage of the Dawn Treader (2010)". Ew.com. Retrieved December 17, 2010. ^ Amy Biancolli, Hearst Movie Writer (December 10, 2010). "'Narnia: Voyage of the Dawn Treader' review". Sfgate.com. Retrieved December 17, 2010. ^ Mark Moring. "Will 'The Dawn Treader' Float?". ChristianityToday.com. ^ "The Voyage of the Dawn Treader: Christian Movie Review < Entertainment". CBN.com. December 10, 2010. Retrieved May 15, 2012. ^ "HFPA: Nominations and Winners". Golden Globe Awards. December 14, 2010. Retrieved December 15, 2010. ^ "Golden Globe Nominations: Christina Aguilera, Trent Reznor Score Nods". MTV. December 14, 2010. Archived from the original on December 16, 2010. Retrieved December 15, 2010. ^ a b "'Glee,' 'Burlesque,' Reznor Score Golden Globe Nominations". Billboard. December 14, 2010. Retrieved December 15, 2010. ^ "Golden Globes: 'The King's Speech,' 'The Social Network' and 'The Fighter' reign supreme". Entertainment Weekly. December 14, 2010. Retrieved December 15, 2010. ^ a b "2010 Phoenix Film Critics Socieety Awards Nominations". Phoenix Film Critics Society. December 14, 2010. Archived from the original on January 16, 2011. Retrieved December 15, 2010. ^ a b "'The King's Speech,' 'Another Year' Lead Nominations at London Critics' Circle Film Awards". London Film Critics Circle. December 14, 2010. Retrieved December 15, 2010. ^ a b "The Voyage of the Dawn Treader Most Inspiring Faith, Family and Values Movie of 2011". Charismamag.com. February 25, 2011. Retrieved May 15, 2012. ^ Reynolds, Simon (December 14, 2010). "In Full: Golden Globes - Movie Nominees". Digital Spy. Retrieved December 14, 2010. ^ "32nd Annual Young Artist Awards - Nominations / Special Awards". ^ "37th Annual Saturn Award Nominations". SciFi Mafia. Archived from the original on April 30, 2011. ^ "Vote & Win - The National Movie Awards". The National Movie Awards. Archived from the original on August 24, 2011. ^ "Weekly Ketchup: Narnia To Continue With The Magican's Nephew << Movie & TV News and Interviews – Rotten Tomatoes". ^ "Chronicles of Narnia: The Silver Chair to Reboot the Franchise". Collider. January 12, 2016. ^ Katharine Trendacosta. "With This Chronicles of Narnia News, the Word 'Reboot' Is Officially Gibberish". io9. Gawker Media.